Being a Shark Conservation volunteer on a group trip can make a significant difference in the protection and conservation of various shark species. In Fiji, a world-renowned group of islands of sandy beaches and turquoise waters, there is truly the chance of a life-time to work on pioneering shark protection projects alongside respected scientists and shark research experts. As a volunteer group, this project is for anyone with a true passion for marine wildlife and the great outdoors. The Fiji Shark Conservation Project gives you the opportunity to near to some of the most endangered and mis-understood animals in the world. As a group on this project, you will be conducting the work of internationally renowned shark research scientists, being directly involved in scientific shark research work, as well as actively working within the local community on mangrove reforestation, recycling and shark education initiatives. Our resident marine biologist and local staff supervise will supervise the group and the conservation work. Projects Abroad also works closely with other local and international marine conservation organisations, including the WWF Global Shark Programme. Volunteers don’t need any previous diving or shark research experience to take part in the Fiji Shark Conservation Project. However, volunteers need to be able to swim and be medically fit to scuba dive. This project is not available for people who do not want to take part in the diving. 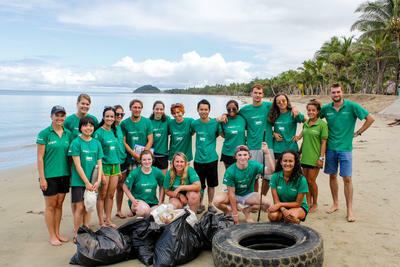 Projects Abroad Shark Conservation volunteers pose for a group shot after a successful beach cleanup. 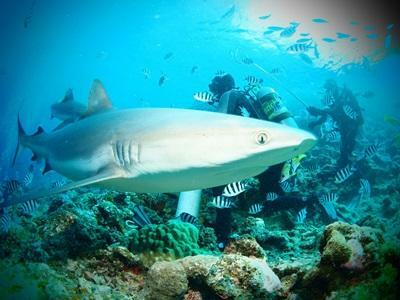 Volunteer in a conservation project underwater with a shark in Fiji, Australasia. Volunteers who have not dived before receive the PADI Open Water dive course during the first two weeks on the project. Volunteers with an existing dive certification equivalent to the PADI Open Water qualification will receive either the PADI Advanced Open Water course or the PADI Rescue Dive course, providing that they are 18 and over. After the dive course, volunteers will also receive the PADI AWARE Shark Conservation Diver Course, which involves both a theory and practical component, as well as a shark dive. Those who already have the Advanced certification or higher will receive the PADI AWARE Shark Conservation Diver Course during their first week, and an extra Shark Feed Dive during their project time. All volunteers staying for four weeks or more complete the PADI Projects Abroad Survey Diver Distinctive Specialty Course. This course focuses on fish identification theory. The work week is typically from Sunday to Thursday from 9am till 5pm. Although we try to include as many varied activities as possible, please be aware that many activities are weather dependent. The project is based in Pacific Harbour, on the south coast of Fiji’s main island of Viti Levu, just 3 hours from Nadi. While you are volunteering in Fiji, you will stay in two bedroom apartments or a nearby hostel. While in Fiji, you get a real insight into the island’s culture. Projects Abroad will also arrange a number of excursions and day trips to various places of interest around the island of Viti Levu.